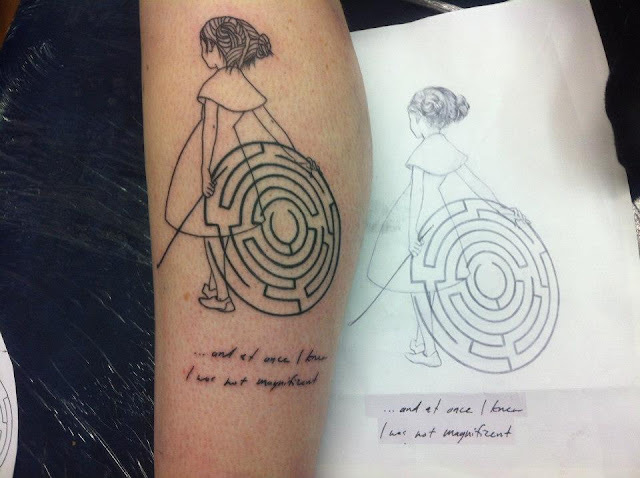 I'm not one of those people who gets impulsive tattoos, all the ones I have I think about for months or years before hand. But I broke my regular habit and allowed my self a somewhat speedy decision on a tattoo yesterday. 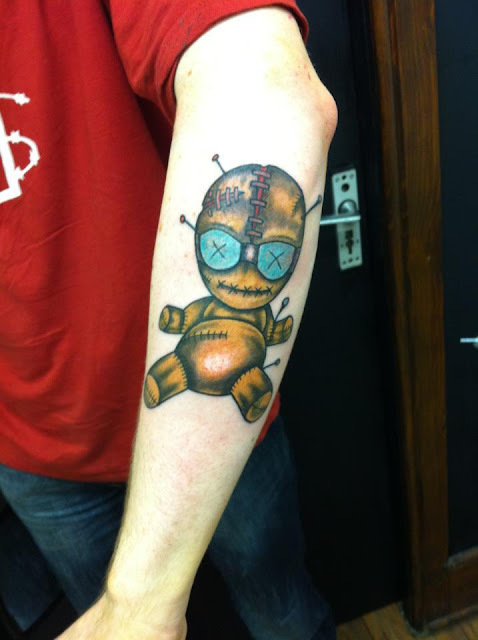 I saw on Living Social that they were doing a special in Bullman's Tattoo Studio, an hour session for only €49(50% discount). I've been wanting to get a new piece for ages, and approached an amazing guy in Dublin to get my upper sleeve done recently. 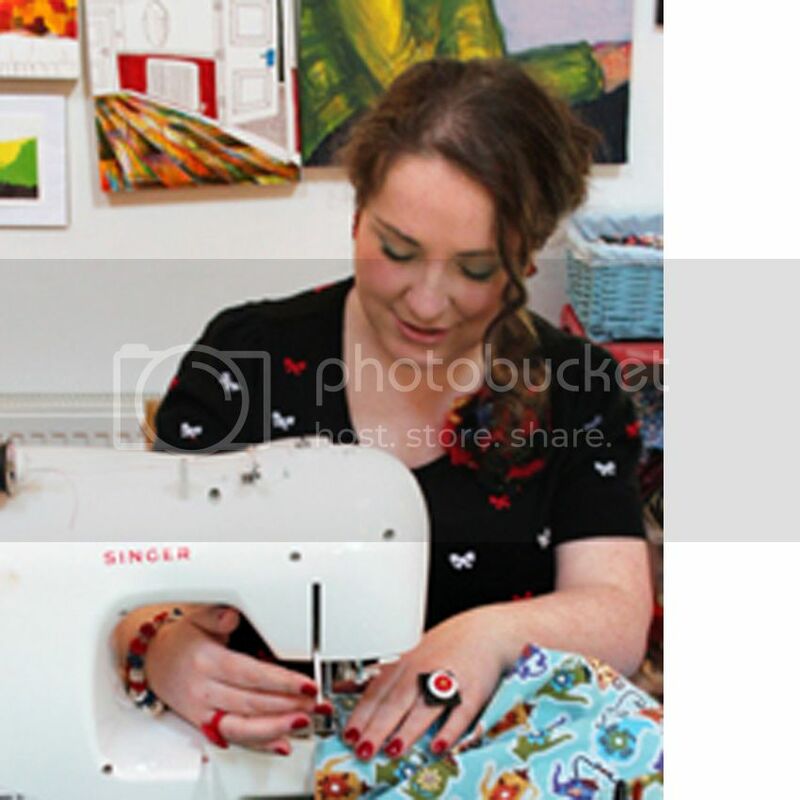 I'm rather fiscally challenged at the moment so don't have the €800 I was quoted for the piece. So this voucher seemed like a good way to get something small done in the meantime. For a while I had the idea of having matching pieces on my inner lower arms, but never really thought much about what to put there. 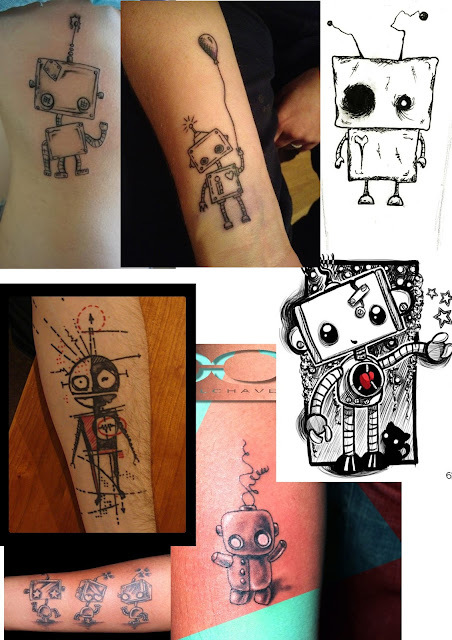 I also for a few months had been thinking of getting a cute robot tattoo, but again hadn't spent much time dwelling on it either. My childhood friend came to visit this week, I suggested that we go into Bullman's and get tattooed together, liking a bonding shoe shopping trip just with more permanent results. You may have noticed from my own work that I'm a bit obsessed with little sad robots, they seem so hopeful and hard working, but filled with pathos because 'they'll never be a real boy'. I love drawing them, but was afraid to design my own tattoo in case I grew tired of my own work. I gave my friend Tommy my two sheets of reference photos( ok, ok so it wasn't that impulsive a tattoo!) and he did up some drawings. I liked the drawings he did, but I didn't love them, and there was an awkward moment that I nearly didn't say anything so I wouldn't offend him(a very Irish thing to do). 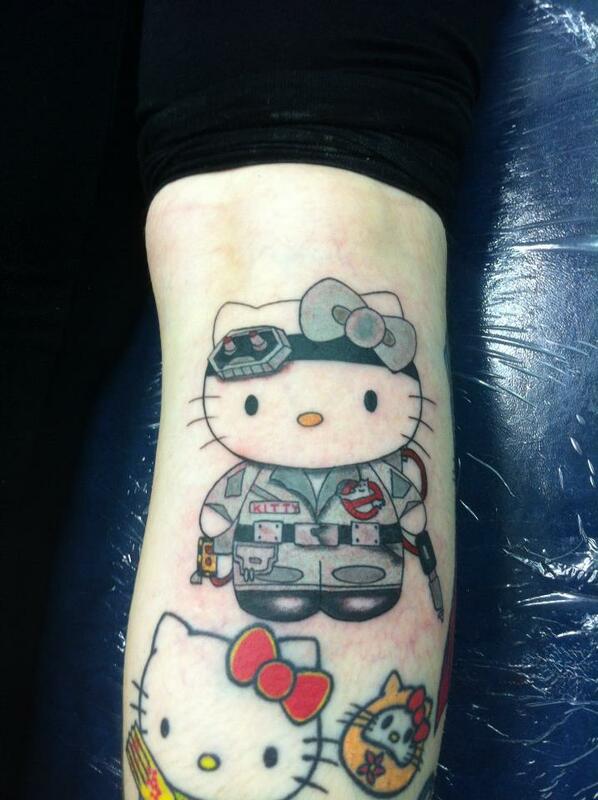 Thankfully I shook off this really stupid notion and remembered that it would be on my skin for the rest of my life. 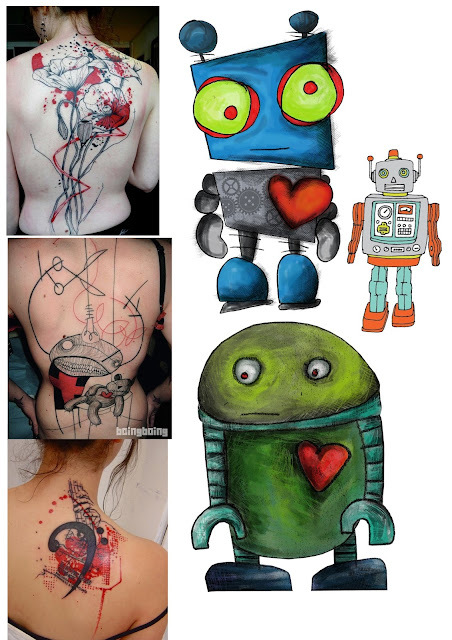 I bit the bullet and did my own sketch right there in the shop, there were certain elements that I really wanted like the over sized heart, tilted head, and sad face. I worked in some elements of his drawing into mine and I really like the merged design. I think Tommy really got a kick out of doing the piece, and it was so nice to be tattooed by a friend. It's weird, I hate going to the hair dressers because they talk to you all the time, but I love going to tattoo shops and having the laugh, maybe because they are wittier folk. It was also great to have Donna there too, we've been friends since we were 12, so it was a good moment to share. Although she does have a freakishly high pain threshold so that she could nearly sleep during a tattoo, I was rather jealous! 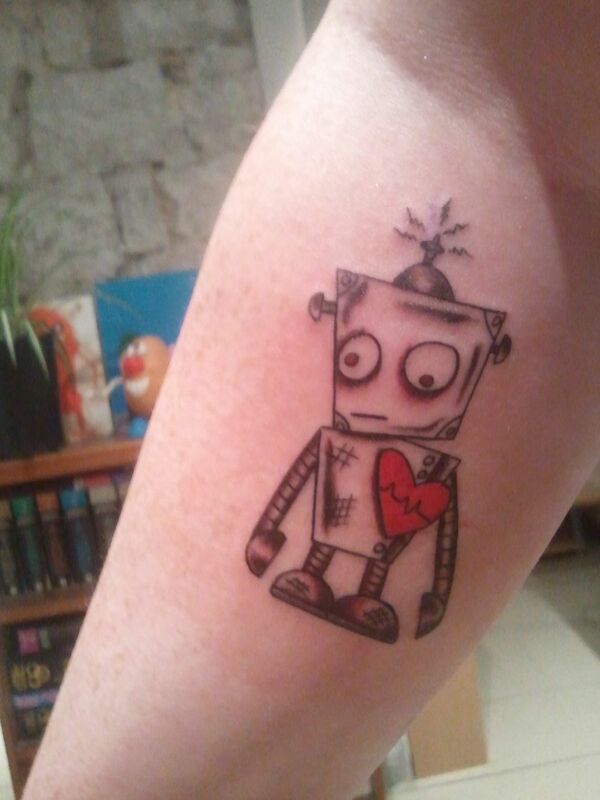 I plan on getting another robot in the same position on my other arm soon, I like the balance of having matching tattoos. I was also thinking that I might like a sheet of ripped paper to be tattooed on as a background for him, the idea that he is really one of my drawings, like he was ripped out of my sketchbook. I'll print out the photo and do some drawings to see what it would look like first though, and maybe run the idea past Tommy for his professional opinion too.